Bob Cafaro has been a cellist with the Philadelphia Orchestra since 1985. In early 1999, Bob was diagnosed with Multiple Sclerosis. Six months later he was nearly blind, unable to use his hands, and he was told he would be on permanent disability. Refusing to accept his prognosis, Bob set out to cure himself of the disease. He has since continued his career as a cellist with the Philadelphia Orchestra. Today he is in perfect health and shows no signs of MS. In his new book, Bob shares the knowledge he gained from extensive research, personal life experiences, and studying people who have accomplished the impossible. Bob is passionate about inspiring and motivating those afflicted with Multiple Sclerosis and other illnesses. "I want to help people. I want to show them how I BEAT MS". The successful mindset and methods he used to beat his incurable illness can be applied to other diseases, injuries, and many of life's challenges. One unique feature of having Bob as a speaker is the added treat of his performance on the cello. This is special because at Bob's lowest point with MS, he was unable to use his hands or play the cello. Hearing and watching Bob play clearly illustrates how effectively he cured himself of MS. Bob enjoys working with audiences of all ages - from pre-school to the workforce and retirement communities. Bob has had success working with MS patients on a one-to-one basis. Learn what Bob did to reverse his own severe case of MS with diet, hydration, mindset, exercise and meditation. People very often rely on only their medication, but much more is required to fight MS. At a personalized consultation session, Bob will help you plan a personalized diet to begin healing and rebuilding cells. You will also be guided through a meditation program tailored to your specific needs, and Bob will recommend an exercise program to get started. August 1999. 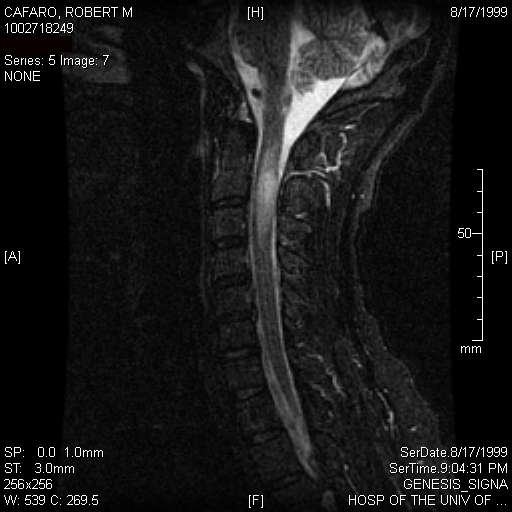 Image of Bob's spinal cord was taken just 6 months after his diagnosis. The 3.5 cm lesion is particularly alarming, and it was possibly a major cause of his debilitation. 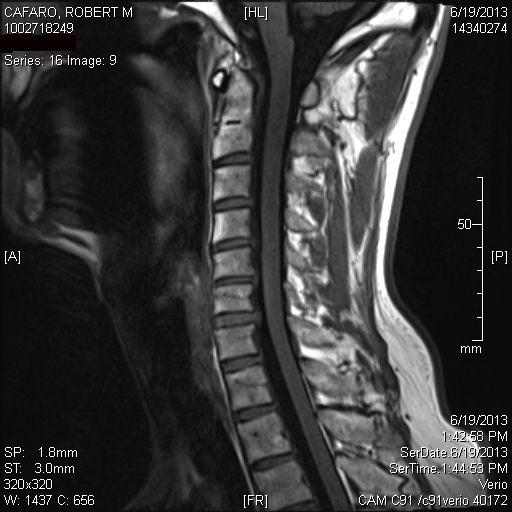 June 2013 image of Bob's spinal cord was taken 14 years later. Amazingly, his spinal cord shows no lesions. 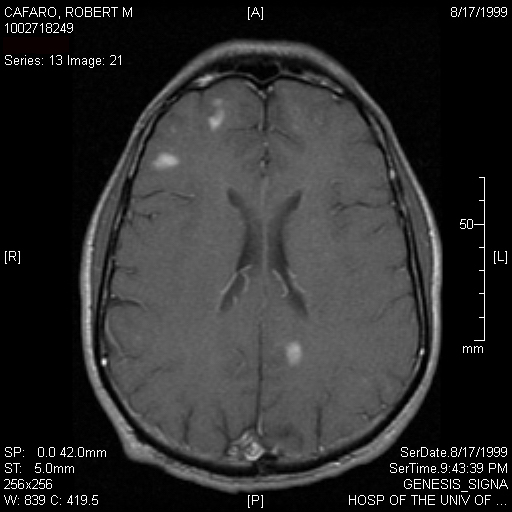 August 1999 image of Bob's brain shows 3 of his more than 53 brain lesions. 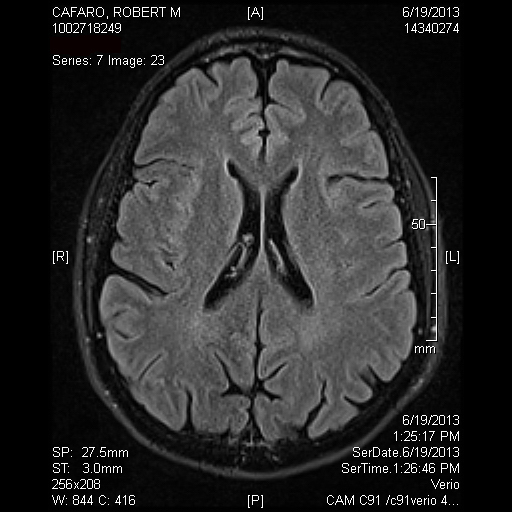 June 2013 image shows the same area of Bob's brain, but with no lesions. All of his 53 brain lesions miraculously disappeared.